Dense fog Wednesday morning will be followed by another round of potentially steady, heavy rain through Wednesday evening. It's been quite a while since I've been able to present such a high-confidence, well-modelled, wet forecast - no complaints here! The 1.29" that fell at Trenton-Mercer Regional Airport represented the wettest day since mid-September. And even though rainfall totals in South Jersey were lighter, 0.48" fell at Atlantic City International Airport - that's the wettest day there since late October. This was actually the second 2+ inch rainfall event this month at Newark - fantastic news given our "severe drought" status in northern and central New Jersey. If it rains enough on Wednesday, November could become Newark's wettest month since April 2014. Remember, high beam headlights will do more harm than good in dense fog. Use fog lights and/or low beams, along with generous use of your brake pedal. 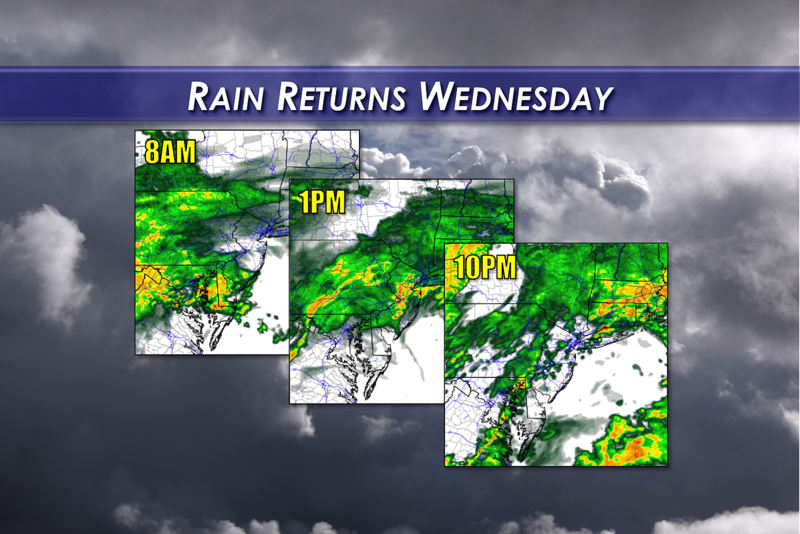 Meanwhile, another solid batch of rain is aiming for New Jersey, and looks to arrive by Wednesday late morning. In general, I don't think Wednesday's rain will be as heavy and persistent as on Tuesday. But occasional downpours and even a few embedded thunderstorms are a possibility once again through Wednesday afternoon and Wednesday evening. Additional rainfall will probably fall in the half-inch to inch range for most of the state. The threat of flooding will be a bit higher today, as the ground is now saturated. That could combine with storm drains clogged by autumn leaves and other debris to cause flash flooding during torrential downpours. High temperatures on Wednesday will reach the upper 50s in North Jersey, lower 60s in Central Jersey, and mid 60s in South Jersey. That's at least 10 to 15 degrees above normal for the last day of November. An approaching cold front will put an end to any and all rainfall sometime Wednesday night through early Thursday morning. Skies will begin to clear as drier air arrives, and a noticeable west-northwest breeze will pickup overnight. Lows will fall to around the 50 degree mark. Skies will probably be mostly sunny by mid-morning Thursday, as cooler air slowly leaks into New Jersey. We'll continue the brisk wind on Thursday, gusting over 20 mph at times. High temps will reach the mid 50s - still above normal for early December, although that temperature peak will probably happen early in the day. Friday looks like a generally pleasant, typical early December day. Our forecast calls for sunny skies, breezy conditions, and high temperatures around 50 degrees. The first weekend of December looks OK too. Expect mostly sunny skies on Saturday with highs in the upper 40s. Sunday will bring a few more clouds and highs only in the mid to upper 40s. Furthermore, Sunday night will be our next chance for a shower - likely light, likely rain, and likely limited to the southern half of the state.